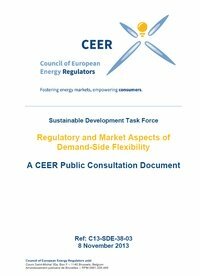 EURELECTRIC welcomes the opportunity to respond to the CEER consultation “Regulatory and Market Aspects of Demand-Side Flexibility”. Demand-side flexibility and the broader concept of demand response (DR) are stepping stones towards empowering end-customers to become active deal-seekers and reap the benefits of competitive markets. Incidentally, engaged customers are crucial to help solve the new challenges emerging on the way to tomorrow’s energy system with increased renewable energy penetration and decentralisation. "We understand the importance of solving the technical, behind the scenes aspects of DSF but we think CEER should have devote more attention to the customers themselves, their needs, the potential impacts and benefits of DSR for them as nothing will be possible without engaged customers." 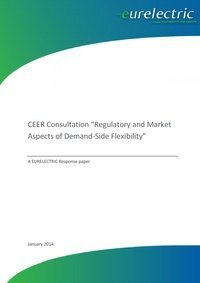 This Public Consultation document draws on an initial literature review, inputs from CEER members and an internal survey among national regulatory authorities (NRAs) to establish a view on how demand-side flexibility arrangements (both market-led and network-led) operate in different Member States. 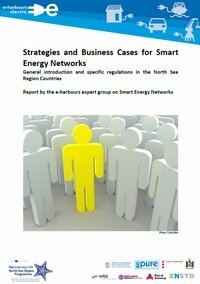 The scope of this document is to give an overview about marketing strategies for smart energy networks. It intends to present concrete yet universal business cases that are applicable in most countries of the North Sea Region.